As one draws near the Entrance Gate of “Disney’s California Adventure”, the turn-of-the-century motif is undeniable and quite exciting to the senses. Each land filled with new adventures to be had, and memories to be made. Today, my dear readers, we will be talking about one land in particular. Hollywood Land. And, as one might have it, one ride that truly towers above the rest. To begin our story, we should first understand the origins of this truly terrifying experience that leaves riders of all ages gasping for more. In 1985, newly appointed Disney CEO, Michael Eisner, asked his team of Imagineers to start developing a new pavilion for the wonder that is Epcot Park (located in Walt Disney World in Orlando, Florida). Among these plans included a small hatchling of an idea, going under the working name of “The Great Movie Ride”, which would one day become an iconic part of every Disney Park around the world: “The Twilight Zone: Tower of Terror”. It is rumored, according to Tower Secrets, a website dedicated to the above mentioned ride, that Eisner was so excited about the new ride ideas he was presented with, he went on to make them their own park, Disney-MGM Studios, later Hollywood Studios, which opened to the public in 1989. The Tower of Terror, although not called that at the time, was a major factor in this park opening. A group composed of Mel Brooks, Eisner, Marty Skylar, C. McNair Wilson, and a few other Imagineers, further developed the idea of “The Great Movie Ride”. It morphed into “Mel Brooks’ Hollywood Horror Hotel”, with Bob Weiss constantly staying behind his idea of an art-deco, high end, 30’s-style hotel. The inspiration for his initial designs can be found from the architecture of multiple Southern Californian benchmarks such as the Baltimore Hotel and the Mission Inn. This powerhouse crew looked at available movie/TV licenses and stumbled upon The Twilight Zone. With a new name and license found, the group now had to get to the nitty-gritty of creating a technology that would move an elevator both vertically and horizontally. Utilizing a technology that Disney is famous for, known as Autonomous Guided Vehicle, or AGV for short, was the perfect solution. This astounding tech uses computers inside the floor of the vehicle, and sends/receives signals with its counterpart computer which is buried in the floor. The messages tell the vehicle to go backwards/forwards, side-to-side, spin in a circle, where its physical boundaries are, or all of the above. This tech is used in all of Disney’s parades. The floats are very rarely driven by any of the characters or their helper friends aboard. It is all automated via use of AGV. The Tower of Terror was unveiled to the public on July 22, 1994. A dream that was nearly 10 years in the making was finally realized. Now, each Disney Park, or group of parks, has this petrifying drop within its bounds. Featuring a plummet of 13 stories, during-ride video recording, random drop sequences, and so much more, it has guests screaming for seconds. However, the fame and adoration were not meant to last, in California. On January 2, 2017, this marvel took its final plunge before closing its doors. 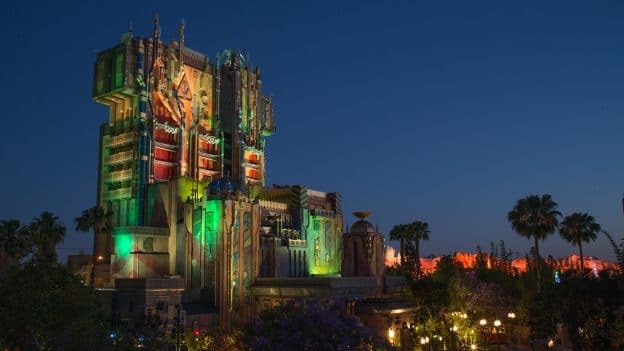 The Tower of Terror, located in California Adventure, is going through a makeover to become a Guardians of the Galaxy themed ride. What’s your favorite Disney ride? Let us know in the comments below! Previous Previous post: Fandom! Front and Center!